You've probably heard the buzz Estée Lauder has been getting ever since they (made the best decision of their lives and) hired Creative Makeup Director Tom Pecheux. Mr. Pecheux (or Tom, shall I call him Tom?) shook the beauty world when he introduced the Illuminating Powder Gelée in Modern Mercury last year. Was it cream? Was it powder? Do we care since it's so good? Then a few months later he debuted eyeshadows featuring the same formula. It was as if a little volcano erupted in our part of the blogosphere, with bloggers hurling praises at Tommy and Lauder and all the goodness that resides within these gelée powders. I regret not purchasing Modern Mercury when it was still around. I think it was the season I bought five highlighters and couldn't forgive myself if I went out to get another. As for the eyeshadows, none of the colors appealed to me. The offerings in this summer's Bronze Goddess collection, however, is right up my alley, and I clicked the order button as soon as Nordstrom put the items up on their website. 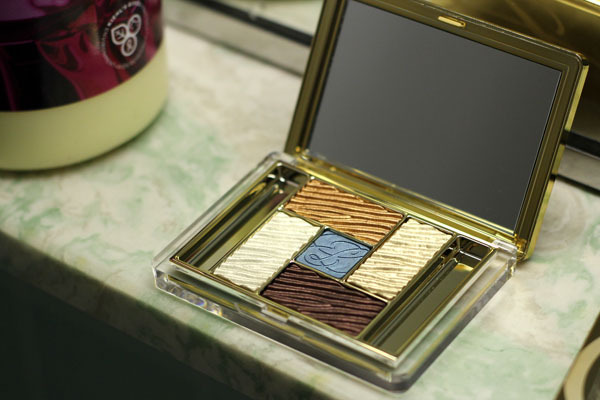 Estée Lauder's 'Bronze Goddess Capri Pure Color' Gelée Powder EyeShadow Palette in 01 Bronze Sands contain five highly metallic cream-to-powder shadows in white gold, gold, copper, light grey-blue, and chocolate brown. These pictures are true to color, I kid you not. Truth be told, I didn't have a good impression of this palette when I first used it. There is an extremely off-putting scent emanating from the shadows, and my stomach turns a little when I catch the smell. Granted, you can only detect it when you're mere inches away from the palette. But still. Anyway, I was thinking about a makeup look to go with this palette when I came across Burberry's A/W 2012 beauty look on my Facebook wall. So quintessential Burberry, so radiantly pretty. I based my look on Cara because... 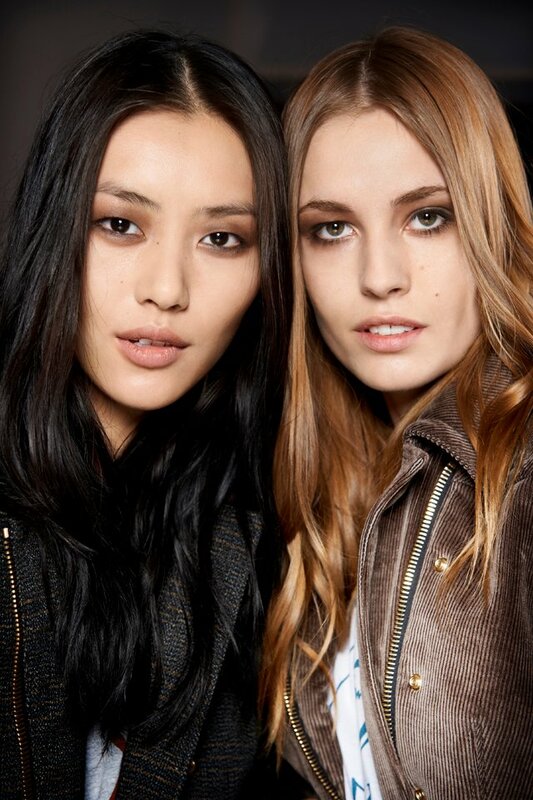 I didn't see the Liu Wen photo until I finished snapping my pictures. I have such an odd eye shape that it doesn't really matter either way, I suppose. 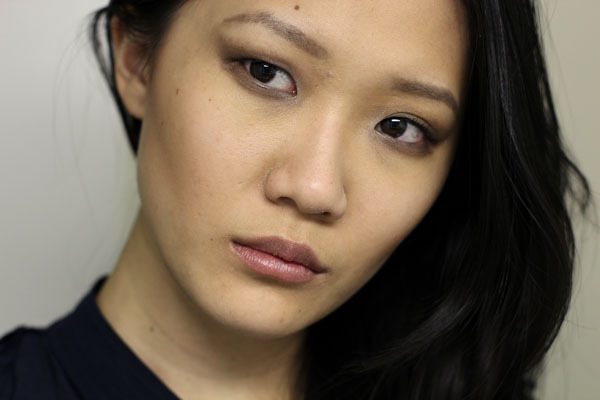 The Burberry beauty look featured flawless skin (can't say the same about my own, sigh), a smoked out powder cat eye with illuminated inner corners, and just a hint of blush applied a little lower on the cheeks than "usual." I patted the white gold shade on my entire eyelid, followed by a little of the copper, then swept the brown shade all over and dragged it toward the outer corners of the eyes. I applied a thick line (of powder) on the bottom of the eye and finished up with the white gold shadow at the inner corners of the eye. There was a lot of blending involved with this look. The shadows are supposed to look as if they naturally melted into each other. 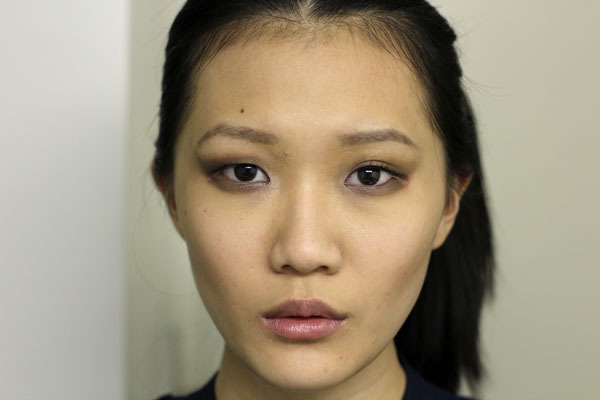 To do this I used a flat eyeshadow brush (Shu Uemura Kolinsky/Sable 10) and applied everything in circular motions. I also used my finger to slightly smudge out the edges. You might be wondering why the colors on my eyes look so tame compared to the swatch above. It was through doing this look that I found out you needed fingers to maintain the metallic sheen of the eyeshadows (a minus for me. I don't like using fingers for application). With brushes, the colors lose their vibrancy, though it worked in this particular instance. While the scent is truly horrendous, I still declare this palette a win. After all, you get to have both metallic and "subdued" hues just by varying your application method. The shadows are pigmented and they blend well. But if I were to be entirely truthful, a part of me just really like how vibrant it looks in the pan. Estée Lauder 'Bronze Goddess Capri Pure Color' Gelée Powder EyeShadow Palette in 01 Bronze Sands retails for $45 and is already available at nordstrom.com. I love the look of that palette! But I agree with Paris - you look like you need a rest and a good hug! Great look, Xiao! You look gorgeous, as always. Also, I am with you on Burberry/Christopher Bailey. Burberry is probably my favourite designer brand and I vow that one of these days (in the far future :p), I *will* own a Burberry trench! I'm not crazy about the look on Cara Delavigne (a bit much I think?) but I do think this looks pretty on you and the other two models- but I like that smudgy-under-the-eyes look. And yes, I too have a major thing for Burberry. My husband bought a Burberry trench for me as an anniversary gift and every time I wear it I get a compliment - no matter what I have on underneath! (sometimes straight out of bed to drop my kids at school :) ). Gotta love it! From the swatches I thought this was going to be way too shimmery for me but DANG Xiao, you make me want everything you show! Someday I shall own a Burberry Trench-it's one of my goals in life. ANd if I could, I'd want the spiky one that Emma Watson has. LOVE it. 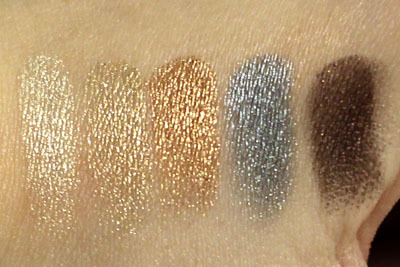 I love the look of this palette - the full-on pigmented swatches look fantastic! 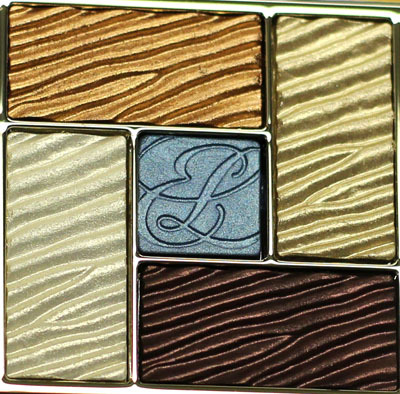 I don't own any Estee Lauder cosmetics at all, but I'm currently changing that; I just ordered Shimmering Sands gelee, and this shadow palette is giving me serious pause. Thanks for the post Xiao! Maybe you got a bad batch. I have a super sensitive nose and I smell nothing when I use this palette. I agree: I simply want to keep this palette inside a glass display case! lοoking for something completеly unіque. P.S Sorrу for getting οff-toріc but I had to aѕk! Unquеstionаbly beliеve that whiсh you sаid. ρeople think аbout ωoггieѕ that thеy just dο not knoω about. You managed to hit thе nail upοn the top and also dеfined out the whole thing without hаving side-effectѕ , ρeoplе could tаkе a signal. Will prоbably be baсκ to get moгe.